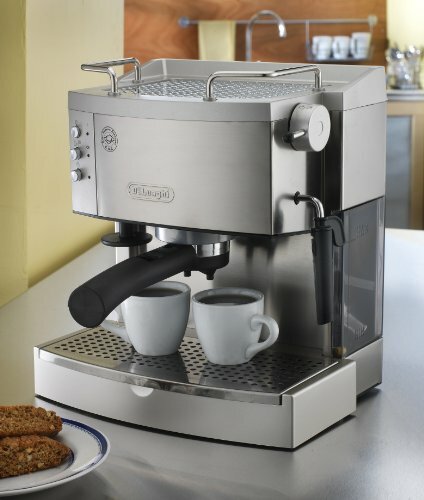 The Delonghi EC702 is an upgrade from the Italian maker’s previous EC155 model. It comes with a range of enhanced features, such as a cup warming tray and a more spacious, removable side water tank. This is a non-commercial pump/semi-automatic espresso machine that comes with Delonghi’s patented dual function system, which allows the user to brew ground coffee or use single-use pods. The EC702 is an entry-level coffee machine that comes without a grinder but with a built-in tamper and milk frothing functionality to offer the home user quality espresso-based beverages, including cappuccinos and lattes, and an affordable price. Additional items you might like to purchase are a separate 50mm stainless steel tamper and a 20-ounce pitcher for heating and frothing milk. If you prefer to grind your beans at home, you’ll need to purchase a separate grinder as this machine does not have one built in. The first thing to appreciate about the Delonghi EC702 is how much of an improvement it is on the EC155 model (which seems only fair given it’s around twice the price of its predecessor). The EC702 is a nice looking, compact machine with a stainless steel boiler and easy-to-use touch button functionality. It also boasts a 44-oz removable side water tank with an indicator that lets you know when it needs a refill. (In real terms, this capacity will give you about five or six beverages per day.) The self-priming operation also ensures a fast heat-up, which means no long wait for that first espresso hit of the day. Discussing such additional features as the dual function holder, easy serving espresso filter, and cappuccino system frother might make it sound like this is a machine that requires technical knowledge to operate. However, nothing could be further from the truth. The EC702 is a machine that’s suitable for espresso making ‘virgins’, which means it is simple to use and produces great results. These fancy sounding features simply allow the user to pull crema-topped espresso and steam milk to coffee-shop standards. The dual function holder means that the machine can take both pre-ground coffee and those ‘love em’ or hate ‘em’ coffee pods, offering additional convenience and versatility. The main downside to the EC702 is that the espresso shots are not always extracted consistently from the two group heads. This is, at best, inconvenient and, at worse, frustrating. Additional minor negatives include the relatively low cup clearance height, which means tall cups won’t fit under the group heads, and the ‘new machine’ taste which takes a while to wash away. In fact, it’s best to flush through at least two full tanks of water before brewing your first espresso for consumption. Also, if you use ground coffee, be prepared for a messy wad of spent grounds (or ‘puck’) when you’re done brewing. I would also advise buying a separate tamper, as the one that’s built into the machine really isn’t up to scratch and can even negatively impact on the ability to pull the best possible shot. While espresso novices might question how something like this could have an impact on the coffee, anyone who has tamped and pulled espresso before can certainly appreciate the significance. However, when the coffee is tamped at the correct pressure and accurately extracted, the EC702 offers up great espresso and the ability to make first-class foam. Really, what more can you ask for in a machine that costs less than $200? 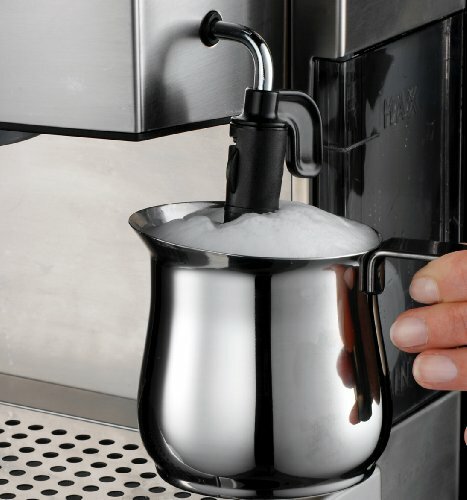 Maintenance-wise, you’ll need to clean the group heads, the drip tray, and the frothing wand after each and every use. More importantly, you’ll need to periodically clean the boiler outlet, the filter holder and do a bit of descaling, to ensure the machine continues to perform optimally. The recommended interval which to clean the inside of the machine is every 200 espressos. Full instructions on maintenance are included in the user manual, but the process does require a bit of fiddly unscrewing and reassembling. It’s worth underlining how crucial it is to maintain this machine, as corrosion can be a real issue if it’s left for too long. In the world of espresso machines, the phrase ‘you get what you pay for’ certainly rings true. However, for less than $200, the Delonghi EC702 offers you basic espresso-making functionality with a range of additional features that lift it into the top range of the entry-level, semi-automatic machines. All of this means that if you’re looking to venture into home espresso brewing without taking out a second mortgage, the Delonghi EC702 should be firmly on your radar. That being said, for this price you shouldn’t expect all the features and functionality of a high-end machine, or all the versatility that you would get if you raised your budget, to $500+. So, is the Delonghi EC702 value for money? Overall, the answer would have to be ‘yes’. While it’s true that not every shot comes out perfectly, the machine is more consistent than not, as long as it is maintained correctly. As such, the Delonghi EC702 puts potentially great espresso within reach of anyone who wants to move beyond the French press or pod machine or extend their home brewing options. The machine, while not fully automatic, takes the hard work out of pulling espresso and the touch button technology allows anyone to produce barista-quality foam without flooding their kitchen with milk. However, before you get out the credit card and start grinding those beans, it’s worth flagging the significant number of third-party reviews that raise issues, again, with the consistency of the espresso shots, which, for some, is enough to give up with the EC702 altogether. Additional gripes include loss of pump pressure and water leaks, with not every complaint apparently resolved to the user’s satisfaction. Not having much first-hand experience with these issues, I can only advise you to do your homework. Should you decide to go ahead and purchase a Delonghi EC702, make sure you keep it clean and well-maintained to minimize the risk of problems with its operation. Cons: …That being said, third-party reviews have raised a number of issues with the durability of the Delonghi EC702 and the consistency of the espresso shots (and not all of those users have been satisfied with the level of support they’ve received from the company). Additionally, there are minor issues, such as the messy ‘puck’ (the spent grounds), and the built-in tamper, which isn’t the greatest. Oh, and you’ll want to flush it through a few times before you start using it to brew to get rid of the metallic taste. 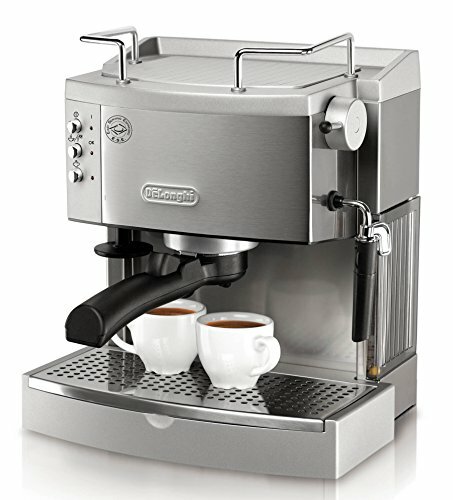 The Delonghi EC702 is undoubtedly one of the best budget options for the home espresso novice looking to make coffee shop-style beverages in the comfort of their kitchen, without spending a fortune on lots of fancy bells and whistles they’ll never use – but concerns over consistency and long-term durability mean purchasers should do their homework before parting with their cash (and make sure they keep the machine well maintained).